One week from today, we – the hubster and I – will be running our fourth half-marathon – the Rock ‘n’ Roll Half-Marathon in Denver, Colorado! We are so excited. And I am a little nervous! Why? Well, there’s this little thing called altitude. Yep, it might make a difference in this race. But, the race is on Sunday and we will be arriving in Denver on Wednesday. I am definitely running this one for fun and I am not going to be concerned about my time. Really. I’m not. My main goal is to cross the finish line and, to run the whole thing. 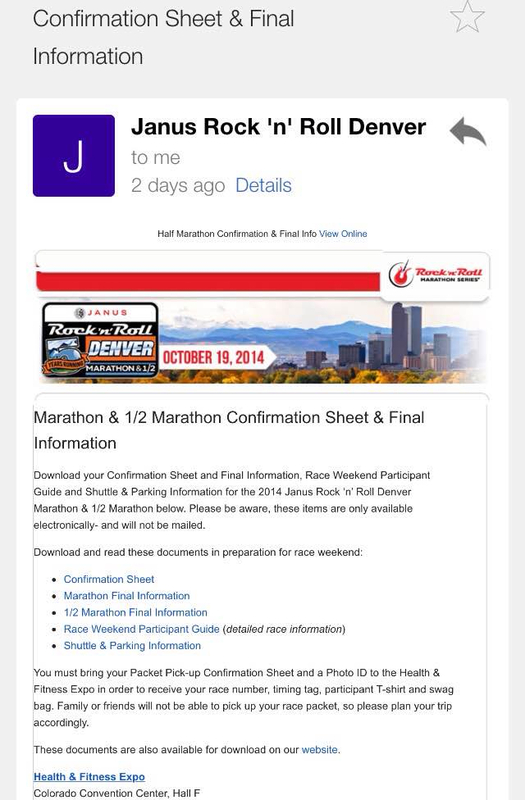 I’m just so excited to be doing another Rock ‘n’ Roll race. So, what else has been happening since my last blog post, which seems like forever ago? It WAS two weeks ago. Yikes! Shame on me! 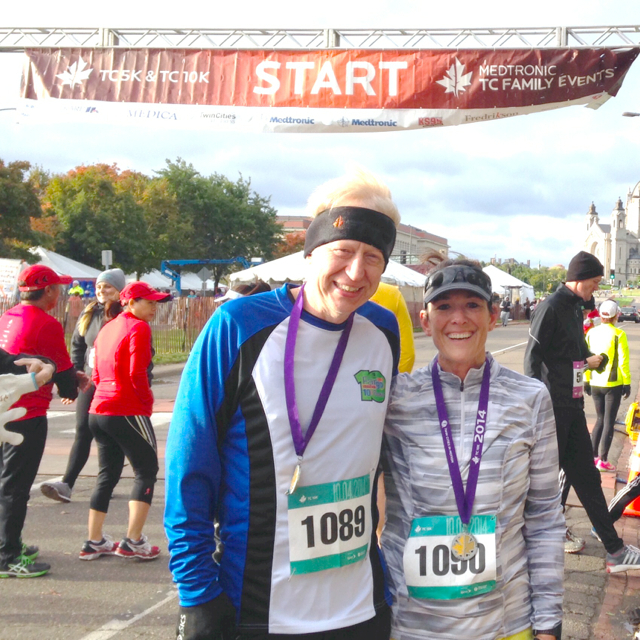 Well, let’s see, I celebrated turning 42 (September 30), we celebrated our 6th wedding anniversary (October 8) and we’ve ran three races – the Medtronics TC 10K (October 4) and the Fargo Mini Marathon Red River Double (October 11). 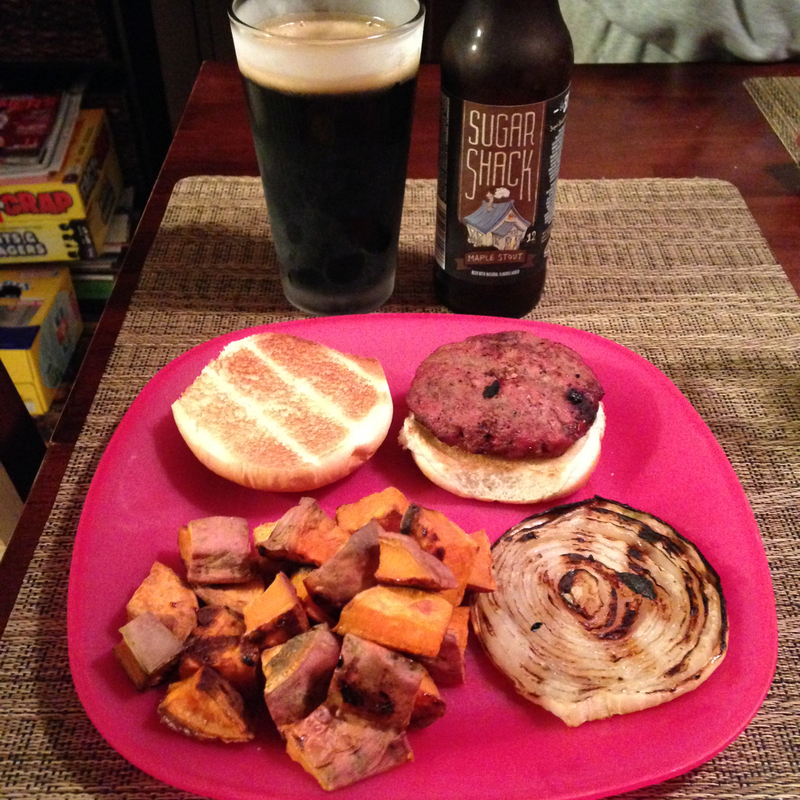 For my birthday, my mom and dad came over and Al made me my birthday meal that I chose – grilled blueberry hamburgers, grilled onions and roasted sweet potatoes. It was delicious! And I even had a beer. Yep. Beer. Not wine! My mom brought me cake – a “poke” cake. She made a sugar-free yellow cake and then poked holes in it and poured sugar-free, fat-free strawberry Jell-O over the top. 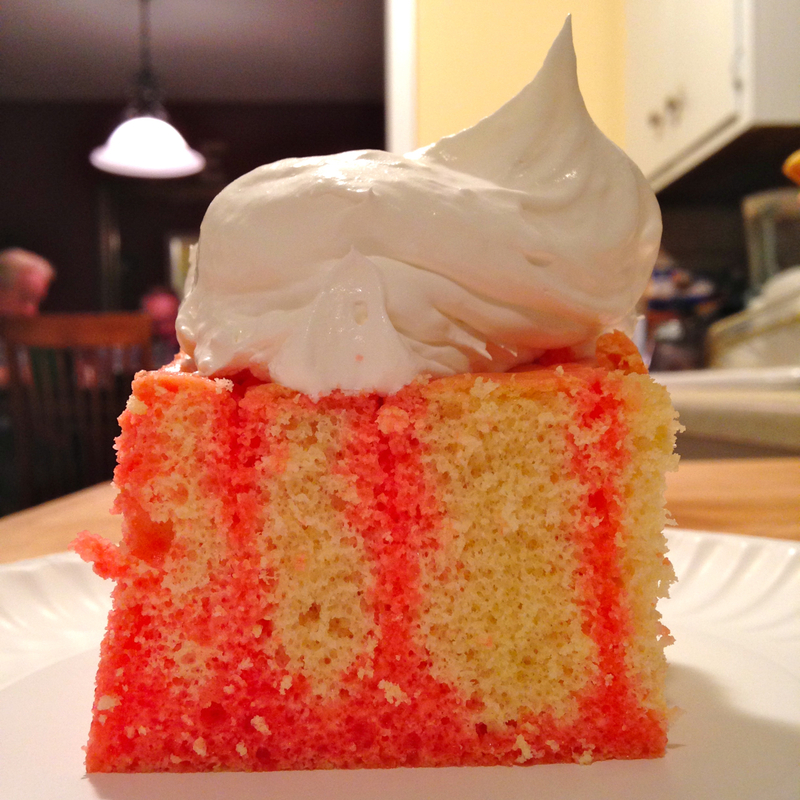 Then, we topped it with Cool Whip. It was so refreshing and not heavy. It was absolutely scrumptious! 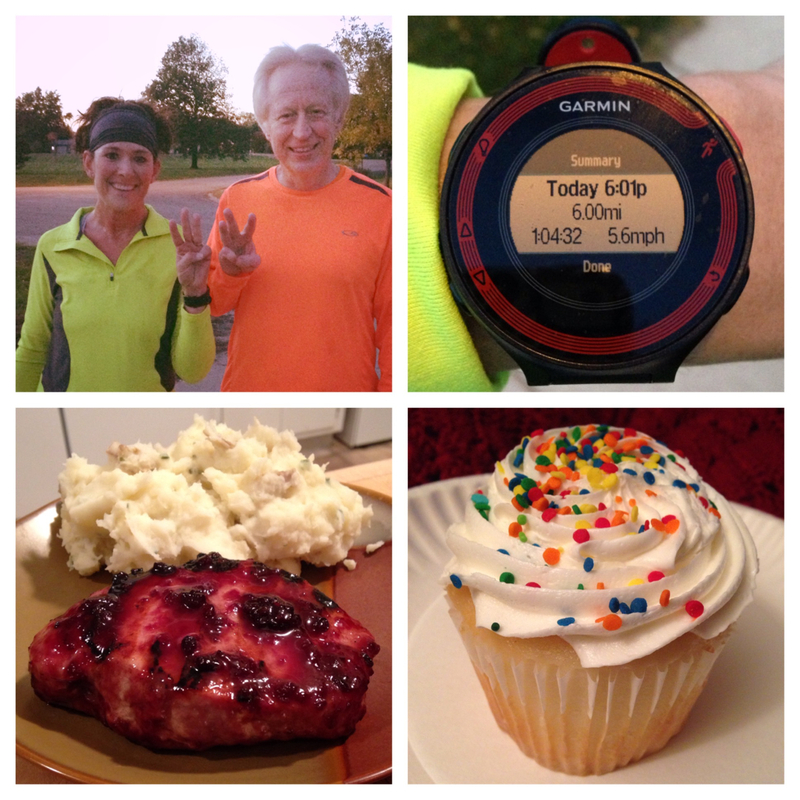 For our anniversary, Al and I ran together again (we ran a 10-miler together for my birthday) – this time only six miles! Six miles for six years of absolute wedded bliss. We’ve been together for nearly 11 years, but only married for six years. And I will add, extremely happily married for the past six years! Yes, I am beyond blessed with the BEST husband in the world. Our meal was grilled pork tenderloins with a blackberry ginger sauce and homemade garlic mashed potatoes. And of course, a cupcake for dessert! YUMMY! 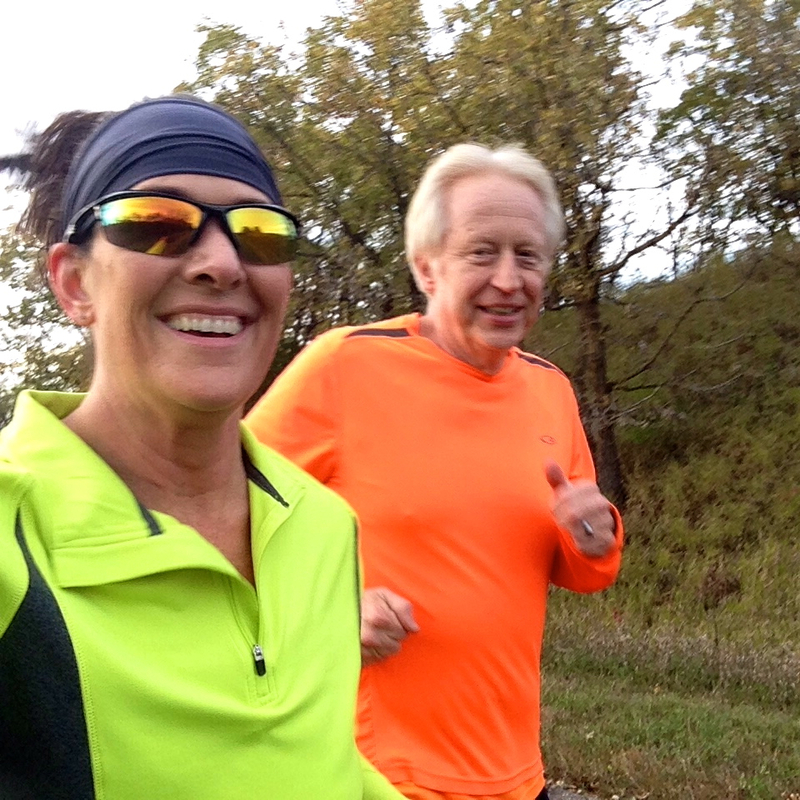 It’s hard to take selfies while running! Most often, they turn out a little blurry. Oh well, it’s fun to try! Many people asked for the recipe for the blackberry ginger sauce. We kind of cheated…it’s not homemade. 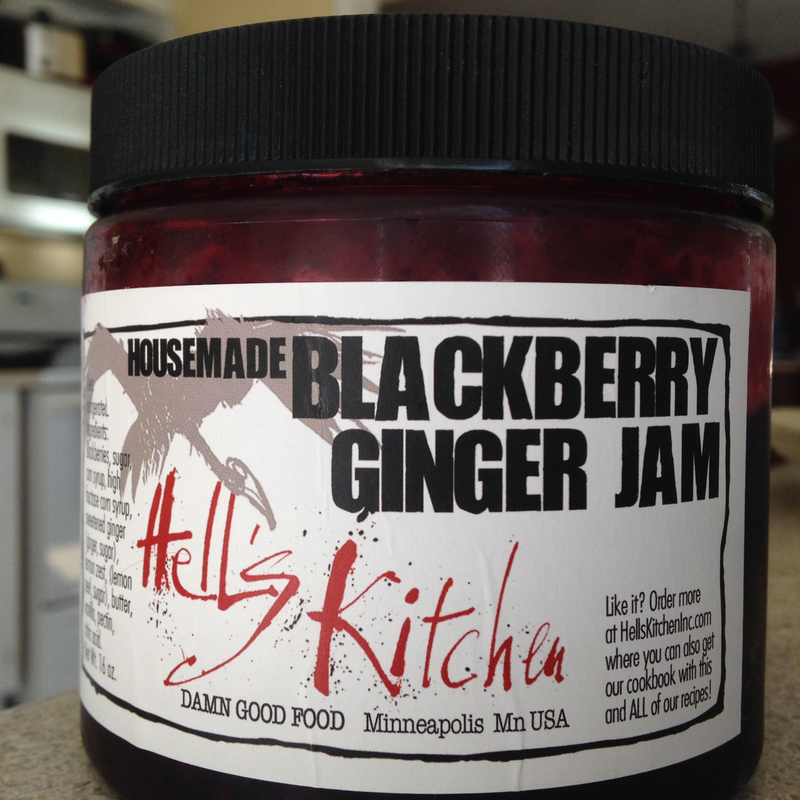 It’s the blackberry ginger jam from Hell’s Kitchen in Minneapolis. We went there after our TC 10K race. If you ever get the chance…GO! It is THE. BEST. EVER! We love their cornmeal pancakes, their homemade peanut butter, their homemade blackberry ginger jam and I love their porridge. YUMMY! So, up first was the Medtronics TC 10K. We missed this race last year because we were in San Jose running the Rock ‘n’ Roll San Jose Half-Marathon. For the fun of it, I checked our results from 2012, which is the last time we ran this race, and I was a little freaked out by it. I ran it in 1:01:56 and Al ran it in 50:15. Both of us thought there would be NO WAY we could touch those times. I have definitely slowed down since then for some reason and AI has kind of slowed down, but not really! Well, let’s just say we were both pleasantly surprised with our times, even though neither of us beat our previous times. BUT, we were both VERY close! I finished in 1:02:02 – just six seconds slower than in 2012. I was totally okay with that! You can check out my detailed results here. Al finished in 50:23, just eight seconds slower than in 2012. So yep, we were both happy with this year’s results. 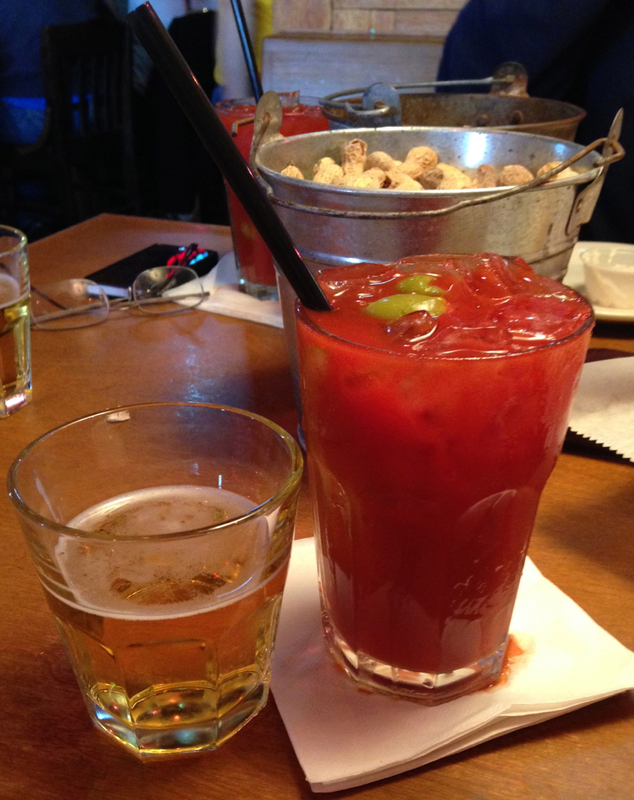 We celebrated with breakfast at Hell’s Kitchen, which of course, included their absolutely divine Bloody Mary’s! 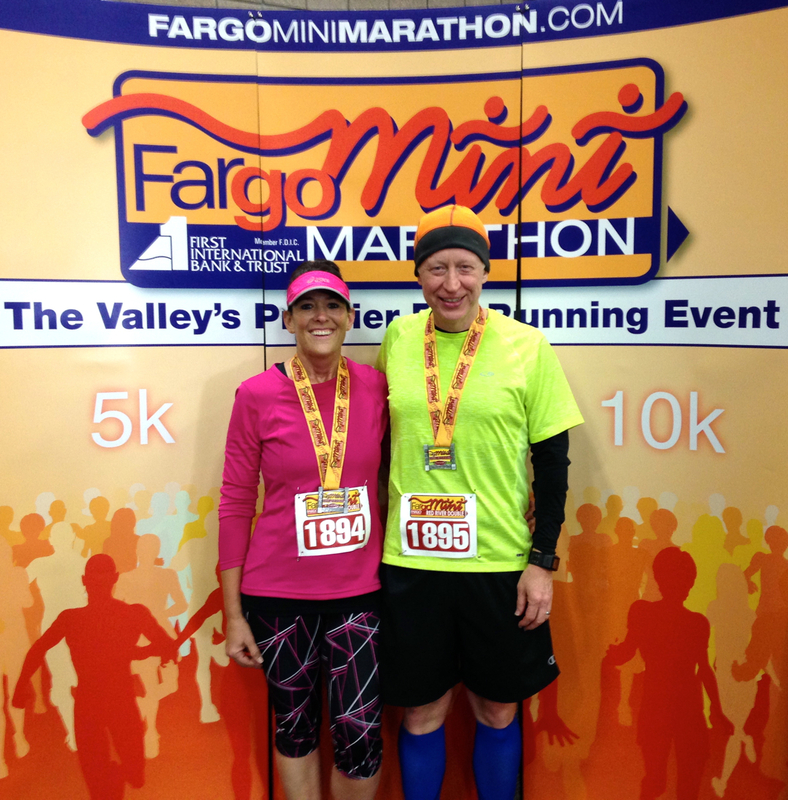 Up next was the Fargo Mini Marathon 10K, which was basically immediately followed by a second Fargo Mini Marathon 5K. This was called the Red River Double. Runners could race any of the early races – the half, the 10K or the 5K, which started at 8 a.m., 8:30 a.m. and 8:45 a.m. Then, at 10:30 a.m., there was a second 5K. We decided to do the double header race a few days before the race and signed up for it at packet picket on Friday night! Again, we missed this race last year because of being in California. In 2012, Al finished the 10K in 48:20 and I finished in 1:05:09. I was really hoping to get a little closer to my time from the Medtronics 10K, but that SO didn’t happen. Not that I am making excuses, but I think there were a few factors into why I didn’t even come close to my time from the previous week. Those factors (excuses, whatever!) 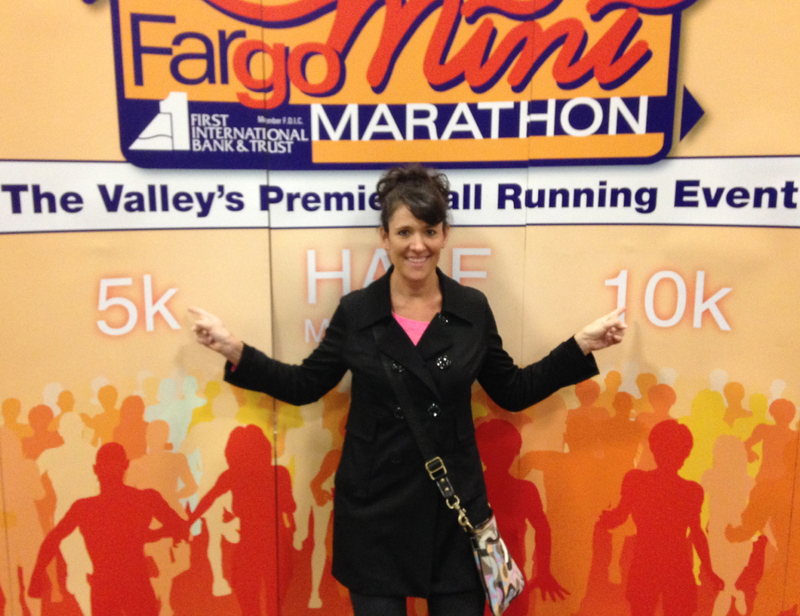 included the weather, it was WINDY at the Fargo race; the route, saying Fargo is flat is overrated, the course WAS NOT flat, there were plenty of hills (inclines! ); and on Thursday, I ran a 12-miler, so my legs were just a little tired. But with all of that being said, and even though I was disappointed with time, it was a fun run and the course, despite it’s hill, was GORGEOUS! Maybe if I wouldn’t have been checking out the sites and just focusing on the run, I could have ran faster. Maybe. I ended up finishing in 1:05:21, just 12 seconds slower than in 2012. So, okay, it wasn’t horrible. You can check out the detailed results here. Al finished in 50:24. He was okay with his time, but not entirely happy either. Our times for the 5K weren’t bad, considering we had just finished the 10K a short time before. Al finished in 25:34 and I finished in 32:42. Not bad. This was at packet pick-up on Friday night. I thought the sign was pretty cool! And this was after the 5K race with our Red River Double medals and bibs! We celebrated by going to Texas Roadhouse with Al’s sister, Vicki, my sis-in-law, who lives in Fargo. It was DELICIOUS! And yes, of course, we had Bloody Mary’s! Funny little story. Before almost every race, the night before, we eat at Noodles & Company. It has kind of become tradition. So, on Friday night in Fargo, we drove over to Noodles & Company. It was PACKED! A bus arrived shortly before we got there with some kind of girls sports team and the line was out the door. We decided that we would go somewhere else. So, we head over to Olive Garden. As we pulled in the parking lot, about 20 other cars had just pulled in (okay, maybe that is a little exaggerated) and there was a line out the door. I was little irritated, to say the least. Plus, I was tired AND hungry. So I said, screw it and we headed to the food court at West Acres Mall. I really didn’t want to try another restaurant, which would probably have just as long of line. BUT, as we pull into the parking lot of the mall, Al notices TGIFriday’s and the parking lot didn’t look THAT full so we drive by the door and there wasn’t a line. So, we decide to go for it. Best. Decision. Ever. It was the spaghetti off the kids menu. 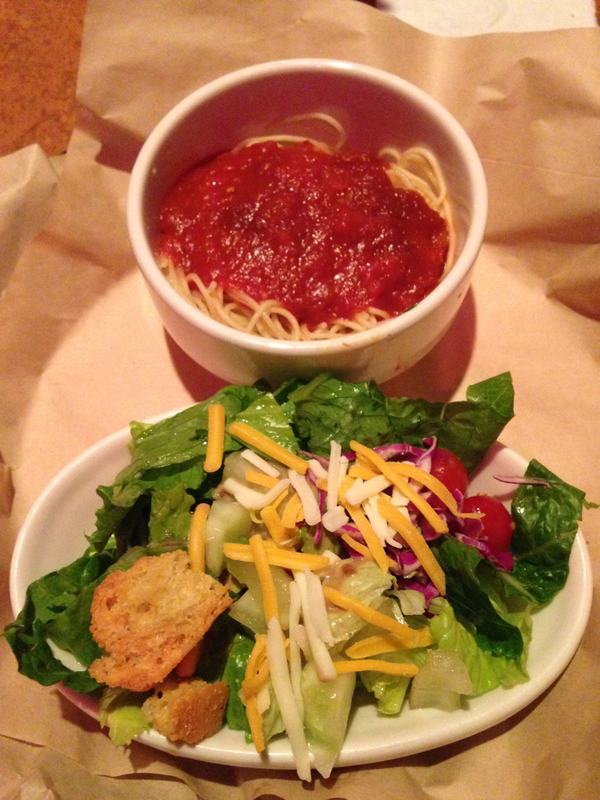 I got to choose a side so I went with the salad. It was seriously SO GOOD! Al ended up going with the three appetizers for $15 special. 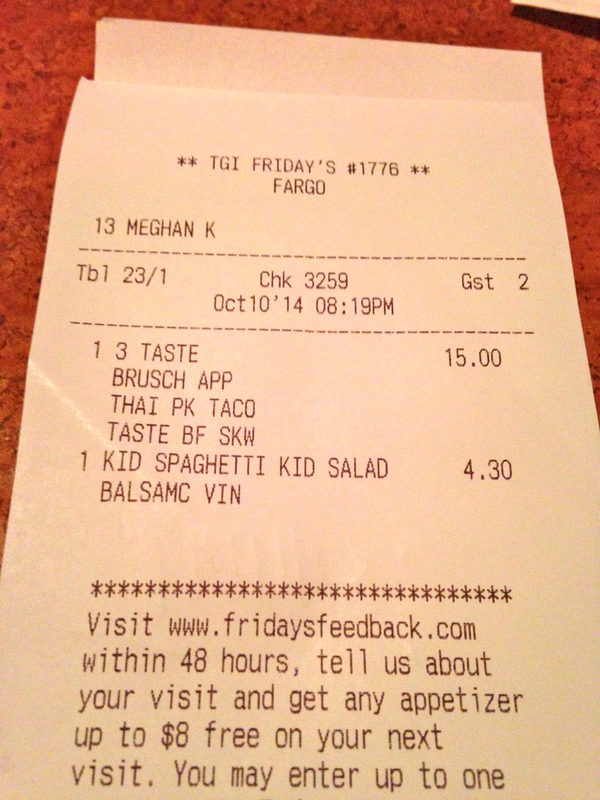 He had the pork tacos, the beef tenderloin skewers and the brushetta. All were very small portions. PERFECT portions. I guess you can say I am a “cheap date!” This will definitely be happening again! ONE MORE THING TO SHARE! Good luck with the Rock and Roll race and enjoy your trip to CO. 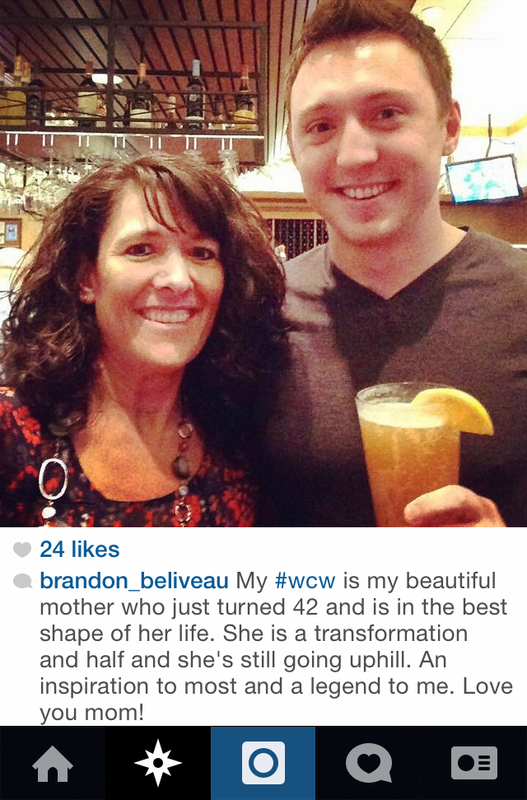 Your son is so sweet! Previous Previous post: A little of this and a little of that! Next Next post: Quick recap of the race!